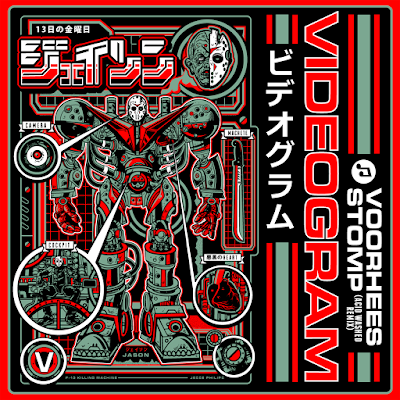 Videogram: Voorhees Stomp (Acid Washed Remix)! Just in time for Friday the 13th, French electronic duo Acid Washed sink their teeth into Voorhees Stomp, the tongue-in-cheek tribute to Crystal Lake's favorite mama's boy! The Record Makers' artists - whose previous remix collaborations include Moby, Wolfmother, and Jimmy Somerville - updates the fun, retro-tinged 2015 original and delivers a hard-edged, stomping crossover dance remix with powerful rhythm, booming effects, and ominous, eerie synths. The track comes with outstanding Jason X-themed artwork by U.S. poster artist Jesse Philips, whose impressive portfolio includes a wide variety of artists such as The Pixies, Radiohead, Napalm Death, and Beck, to mention just a few. Available as a digital-only track via my official Bandcamp page, with iTunes, Google Play etc. following on Friday the 13th. Get it here.